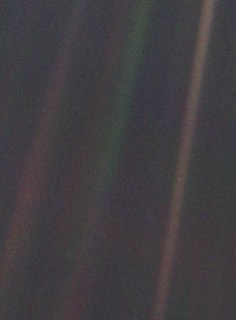 Earth as seen from a distance of about 3.7 billion miles away via Voyager 1. Can't find it? It's the tiny speck about mid way down the right, brown column. Today is Earth Day, a holiday designed to promote environmental awareness. Now, while many people take our world for granted, opinions may change upon viewing our home, so far as we know, the only world capable of supporting life in the entire universe, from a distance of about 3.7 billion miles. On February 14, 1990, its mission completed, Voyager 1 turned back towards the Sun and started snapping photos of the solar system. Being a narrow-field camera, it took 4 months to finally get enough images to assemble a composite image of our planetart family. One of the images was especially stirring: the Earth, less than a pixel in size, silhouetted against the blackness of space. 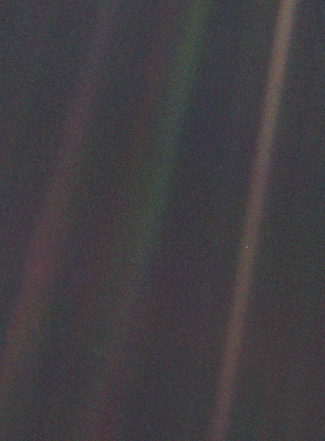 This photo and the name attached to it by Carl Sagan, who referred to Earth as a “pale blue dot,” would forever alter our perception of our place in the universe. Suddenly, our world, not to mention ourselves, seemed a lot less important in the greater scheme of things. 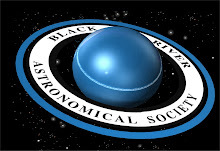 So, on this April 22, 2011, take a moment to cherish the Earth, our only home in the cosmos and the perfect set of circumstances that, by the longest of odds, came together in just the right manner so as to make life here possible.